Ground level decks are a specialty unto themselves. The lower a deck gets to the ground the more challenging it can become to build the supporting structure below. Thankfully there are lots of different ways to accomplish this and even a few differing opinions. You will want to read what's here and maybe ask a question or throw in your helpful insights. Have a question about ground level decks? 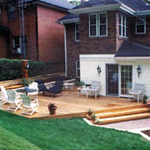 If you have a question about ground level decks, you've come to the right place! If you're looking for other visitors submissions, click here or scroll past the submission form. Building a deck on extremely soft ground. Bamboo deck for Canadian winters? Have any Canadians build a ground level deck out of bamboo material? If so, how has it stood up to the Canadian winters? Is there any requirement to remove the grass under a new wood deck? The deck will be no more than 2 feet off the ground.